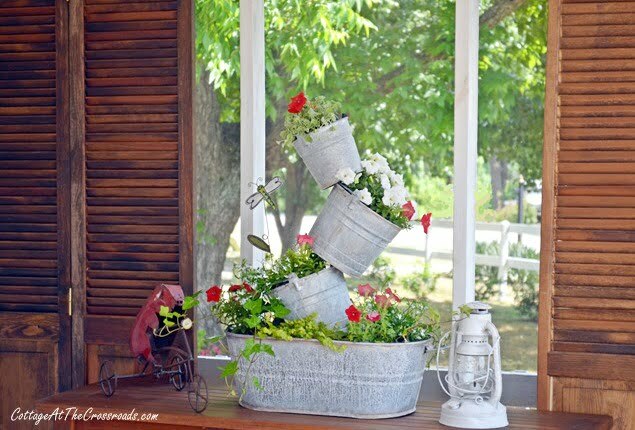 Have you been admiring those topsy turvy planters and you’ve wondered how to make them? I made several last summer, and my favorite is this one that I made using new, galvanized buckets found at our local agricultural store. Just this week I repotted the planter with fresh flowers and moved it onto our front porch. 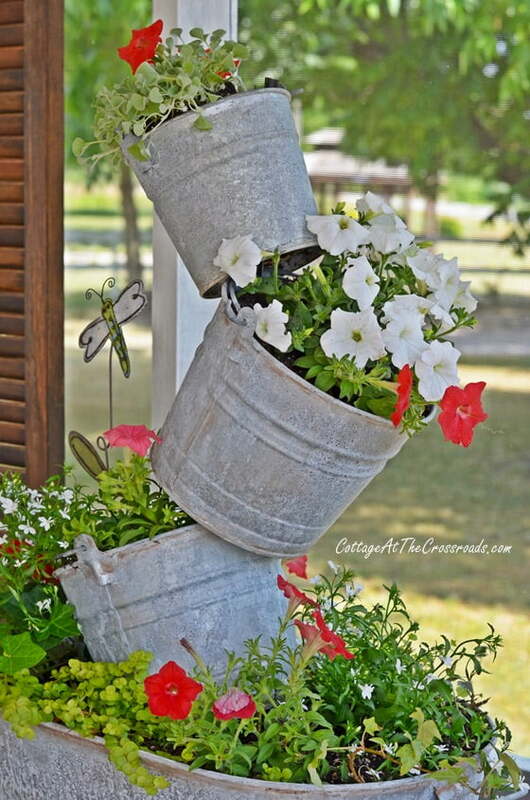 And I am loving the topsy turvy buckets just as much as I did last summer. Last year I used orange and peach colors in the buckets, and I must say that I really loved that combination. But I decided to go with a different color scheme this year since I was moving the planter onto our front porch. You can find the full tutorial on how I made the buckets in my post Topsy Turvy Galvanized Buckets. Since I use a lot of red on our front porch, I decided to replant the planter with red and white flowers this year and I’m really pleased with the results. 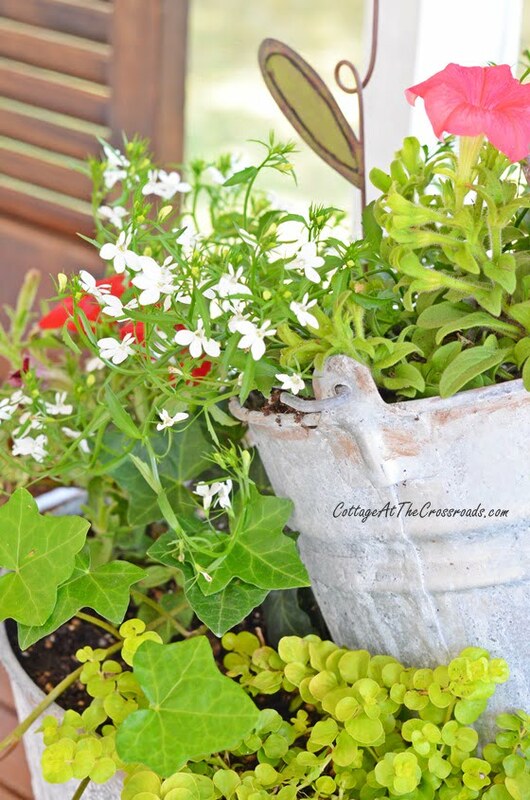 In the bottom oval bucket, there is a mix of ivy and creeping jenny along with red petunias and white lobelia. The red petunias will spread and cascade down the side of the planter because they are Wave petunias, and the lovelia should do the same. The buckets that I used to make the planter were all new, shiny galvanized buckets, but as you can see in this photo, they have acquired an aged appearance. I did speed up that process last year by spraying the buckets with a chlorine bleach mixture and letting the buckets sit in the sun to dry. Then I added a little brown paint around the top and bottom of them. 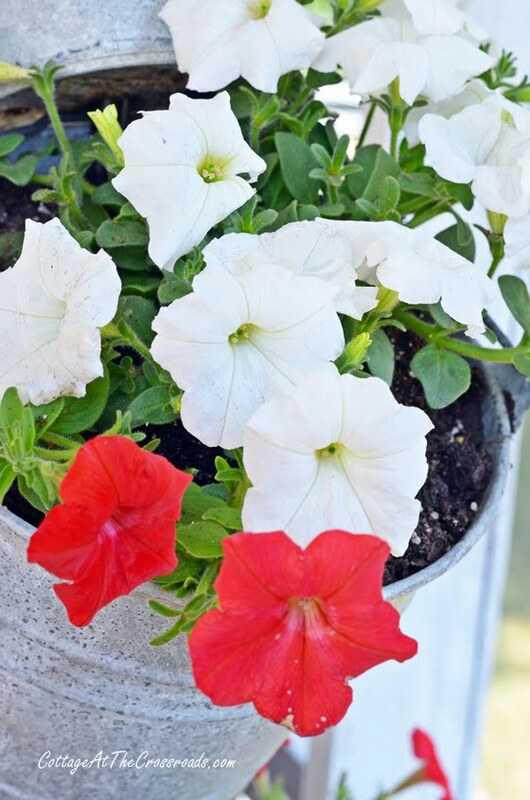 In one of the buckets I used a mix of white and red Wave petunias. I just love how the red looks against the metal buckets! 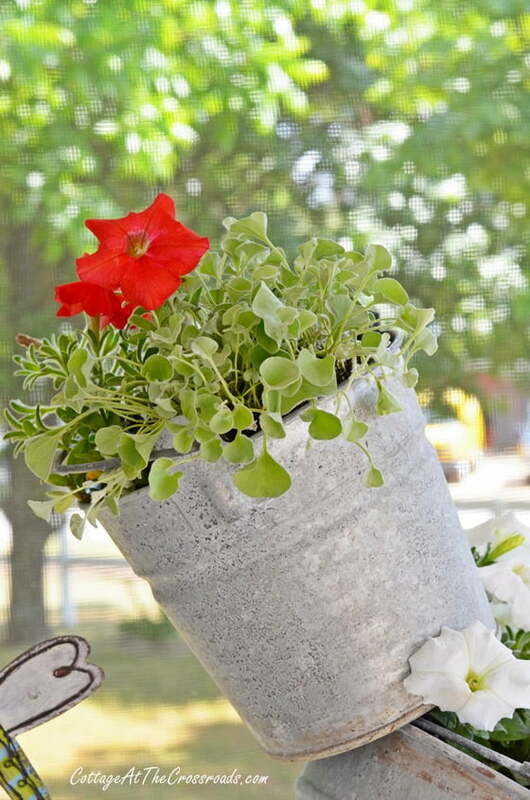 The top and smallest bucket contains one red petunia plant and creeping dichondra which is sometimes called ‘Silver Falls’ because it drapes down the sides of containers. It is drought tolerant which should make it a good choice for the top bucket because the water drains quickly out of that one. 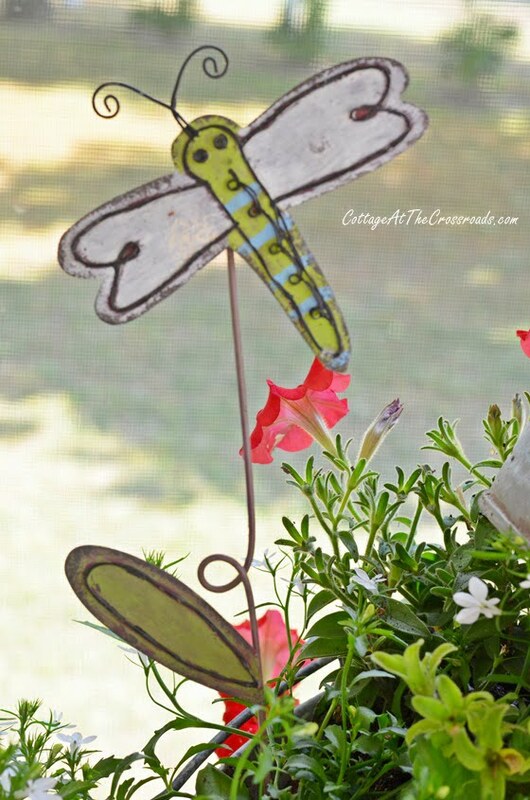 To finish off the buckets, I used the same decorative dragonfly pick that I used last year. I can’t wait until all the flowers grow and fill in. They should do well in this spot because it gets plenty of sunshine daily. If you’ve been admiring any of those topsy turvy planters, I urge you to go ahead and try your hand at making them. They really are not hard to make but will bring you plenty of compliments! If you would like to see more of our gardening projects and posts, visit our blog Cottage at the Crossroads. Or you can also follow us along on our Facebook page or Pinterest. Great looking arrangement! I’ve used the “topsy turvy” buckets before, but with clay pots. Really makes a nice statement. I bet your front porch looks wonderful! Thanks so much, Jenny! Would you believe that I’ve never made the topsy turvy planters with terracotta pots? The porch is coming along and I’ll be ready to show it next week. So creative! I love this idea. 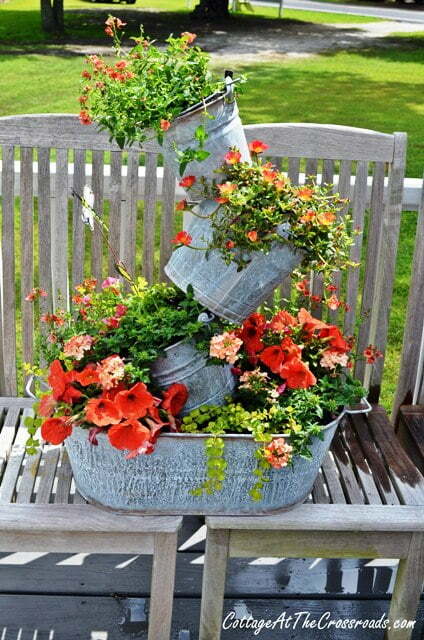 I love the galvanized buckets for this! The colors of the flowers seem to really pop! You did a great job! jenny recently posted…Easy Placemat Pillow–You CAN Make Some Too! Thanks for leaving your comment, Jenny! I love the red with the color of the buckets, too.